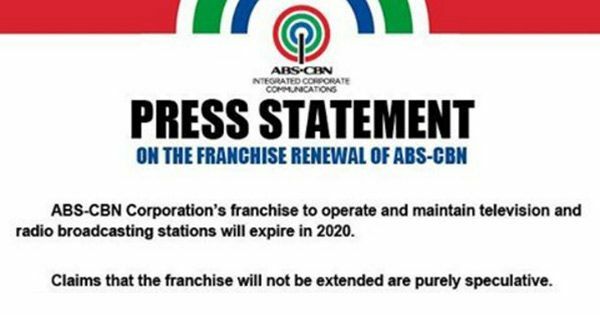 ABS-CBN franchise expires in 2020: Should congress during Duterte admin renew it? 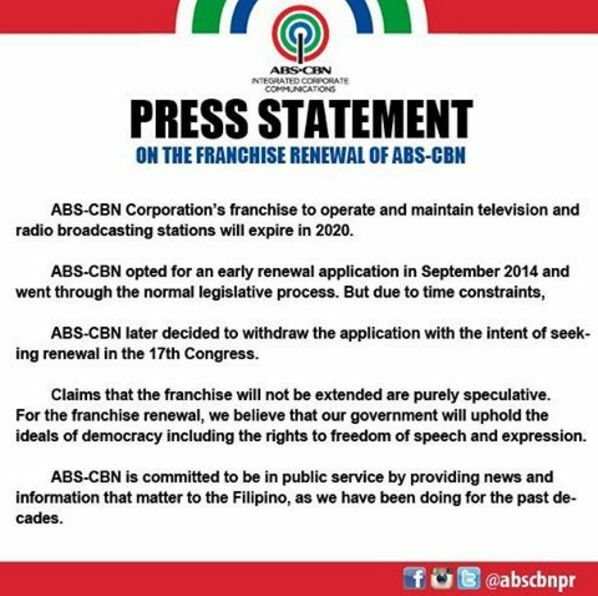 Home / news / trending topic / ABS-CBN franchise expires in 2020: Should congress during Duterte admin renew it? ABS-CBN has been accused of being biased against incoming President Rodrigo Duterte. Should the 17th Congress during his administration renew the network's franchise expiring in 2020? "Two bills were introduced in the 16th Congress for the renewal of ABS-CBN’s franchise granted in March 1995: one by Isabela Rep. Giorgidi Aggabao, filed in September 2014, and another by Baguio Rep. Nicasio M. Aliping Jr., filed in December of the same year," INQUIRER.net reported. "The bills would renew ABS-CBN’s right to operate TV and radio broadcasting stations in the Philippines through microwave, satellite or whatever means, including the use of new technologies in television and radio systems," the report said. According to the news website, the Kapamilya network's 25-year franchise expires on March 30, 2020. In a press statement posted on Instagram, ABS-CBN confirmed the date of expiry of their franchise. "ABS Corporation's franchise to operate and maintain television and radio broadcasting stations will expire in 2020," the company said. The broadcast giant also confirmed Inquirer's report. "ABS-CBN opted for an early renewal application in September 2014 and went through the normal legislative process. But due to time constraints, ABS-CBN later decided to withdraw the application with the intent of seeking renewal in the 17th Congress," the network explained. The 17th Congress' term starts on July 1, 2016 and ends on June 30, 2022. Duterte and his supporters are unhappy about ABS-CBN's attacks against him during the campaign season, according to the Inquirer report. ABS-CBN is among the media networks Duterte apparently boycotted and barred from covering his press conferences and activities. And there has been word that the network's future is in peril. Claims that the franchise will not be extended are purely speculative. For the franchise renewal, we believe that our government will uphold the ideals of democracy including the rights to freedom of speech and expression. ABS-CBN is committed to be in public service by providing news and information that matter to the Filipino, as we have been doing for the past decades. Should the 17th Congress during the Duterte administration renew ABS-CBN's franchise which will expire in 2020? What do you think?